Used to make your garage door opener compatible with the Sentry transmitters, reduce the devices in your car. 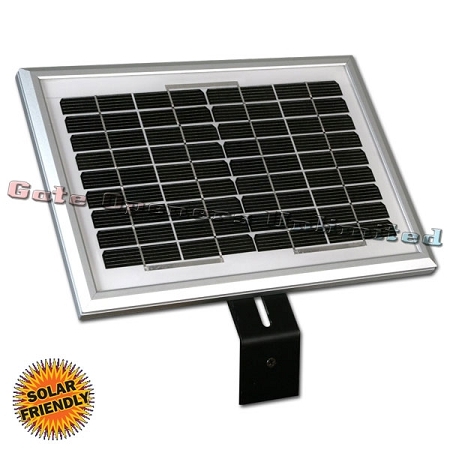 The 520015 Solar Panel Kit 5 Watt Solar Panel kit may be used to charge the battery in the Sentry gate opener. Solar charging eliminates the need for AC power at the gate saving money and installation time. The energy efficient design of the sentry gate opener allows up to 8 weeks of operation without any sun and additional solar panels are not needed. The solar panel kit includes a 5 watt solar panel, 15 of cable equipped with plug n go connector (no wiring), mounting bracket and hardware. If solar panel must to be installed more than 15 from the battery use Sentry charge cable extension kit PN 630050. - Solar charged Sentry gate opener delivers the most cycles per day. - Protect yourself from power outages. - 15 ft Plug N Go Cable included. - Contains mounting bracket and hardware needed for installation. - 5 Watt Solar Panel.